This Psalter was one of the casualties of a famous fire in 1731, which damaged parts of two libraries that later became part of the British Library. In the 19th century the damaged books were repaired, leaf by leaf, by inserting them into custom-made paper supports. Surprisingly little of this book's text has been lost. A description made in the 17th century, before the fire, recorded that there was an inscription which claimed this book to have belonged to St. Oswin, king of the Anglo-Saxon kingdom of Deira in Northumbria, who is buried at Tynemouth. This could not have been literally true because Oswin died in 651, while the psalter was made in the 11th-century in Ireland. Possibly it belonged to Tynemouth Abbey in the Middle Ages where tradition may have been associated it with relics of King Oswin or his tomb. 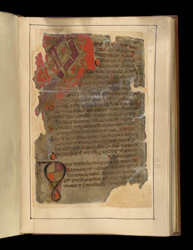 In early Irish Psalters such as this it was common for there to be enlarged initials dividing the 150 Psalms into three sections: at Psalms 1, 51, and 101. This initial 'Q' marks the start of Psalm 51.